Today the Fed will decide whether to raise the cost of money. Some are worried that a potential hike could also cause mortgage rates to go up. In a recent survey by Harris Poll on behalf of Trulia, Americans said that although rising mortgage rates are a concern, Americans (30 percent), especially millennials (37 percent), are more worried about whether they'll find a home they like. Trulia says low inventory is a bigger obstacle for potential homebuyers than a rise in mortgage rates. 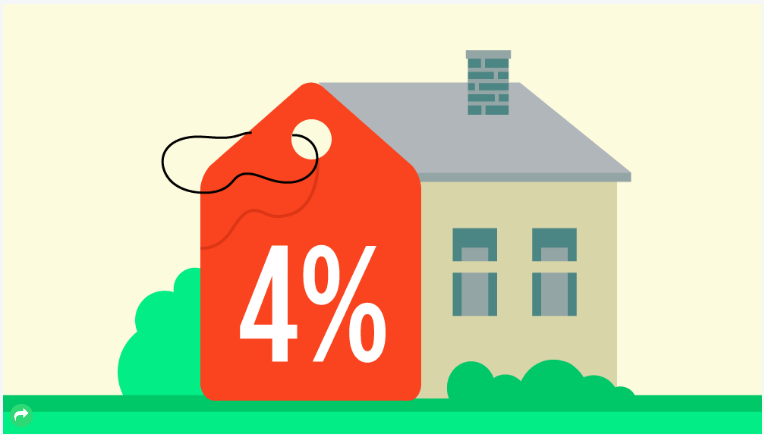 Even if mortgage rates rose to 4 percent, the biggest impact on the average homebuyer would be a few thousand dollars dropped from their home budget. Today the Federal Reserve will hold a much-anticipated meeting and decide whether to increase the cost of money. According to a report by Inman writer Lou Barnes, the Fed’s fund rate is at an all-time emergency low, and the Fed owns nearly $4 trillion in Treasurys and mortgage-backed securities. Furthermore, mortgage rates are down from 4.25 percent closing to 3.5 percent in just six months. But according to a recent study done by the Harris Poll on behalf of Trulia, more Americans are perturbed by the possibility of not finding a home that they like.
.@Trulia: Americans are more worried about finding a home they like rather than a rise in rates. 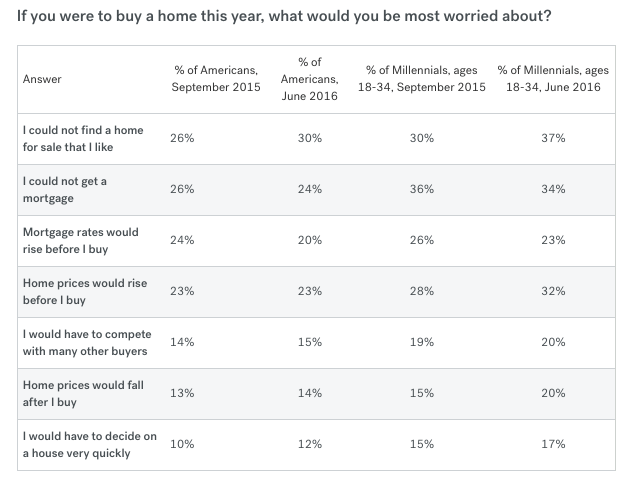 The survey asked a total of 2,034 total respondents ages 18 and older: “If you were to buy a home this year, what would you be most worried about? The results revealed that nearly 30 percent Americans are worried they won’t find a house they like, compared to 20 percent who say they are worried about rising mortgage rates. When broken down by age group, 37 percent of millennials (ages 18 to 34) are worried they won’t find a house they like, which is up 7 percentage points from September 2015.
.@Trulia survey: 30% of respondents are worried about finding a home they like. “Consumers are increasingly worried about tight inventory when finding a home, and rightly so,” said Ralph McLaughlin, chief economist at Trulia. Although it seems low inventory is the bigger issue, a rise in mortgage rates is still indeed a reasonable concern for potential homebuyers. Trulia says an increase in mortgage rates to between 7 and 10 percent would be needed to take away the financial benefits of owning a home. But even a rise to 5 percent on a 30-year mortgage could impact the real estate industry. According to the study, 19 percent of Americans would be discouraged from buying a home if the rates rose to 5 percent, and another 19 percent would be discouraged if the rates rose to 6 percent. Add those numbers to the Americans who already feel mortgage rates are too high (15 percent) and to the 61 percent of Americans who said they’d be discouraged from buying a home if rates rose to 7 percent, it doesn’t seem like the picture will come out looking too pretty. However, Trulia says even if the Fed’s rates rise by 25 basis points, mortgage rates would still be quite favorable for homebuyers based on their budget. For example, a buyer with a household income of $60,000 and a 20 percent down payment would be able to afford a $301,000 home instead of a $308,000 home with a mortgage rate hike to 4 percent.
.@Trulia: If rates rose to 4%, the biggest impact would be a lower home budget.